Monday’s Iowa caucuses resulted in record voter turnout (at least on the Republican side), but did that translate into increases in audience listening, web traffic, or social media engagement? In many cases the answer was most definitely “Yes!” NPR.org had 80 percent more users than the last Iowa caucus in January 2012, our main Twitter account saw huge increases in retweets/likes/replies, and NPR One saw bumps in listening times Monday and Tuesday. Still, that doesn’t tell us all that much, so the Audience Insights team took a wide-ranging look at all aspects of our coverage, from broadcast to web to social media. Here’s what we learned over the last two days. Tuesday we saw at least two cases where changing our headlines increased the traffic we get from search. 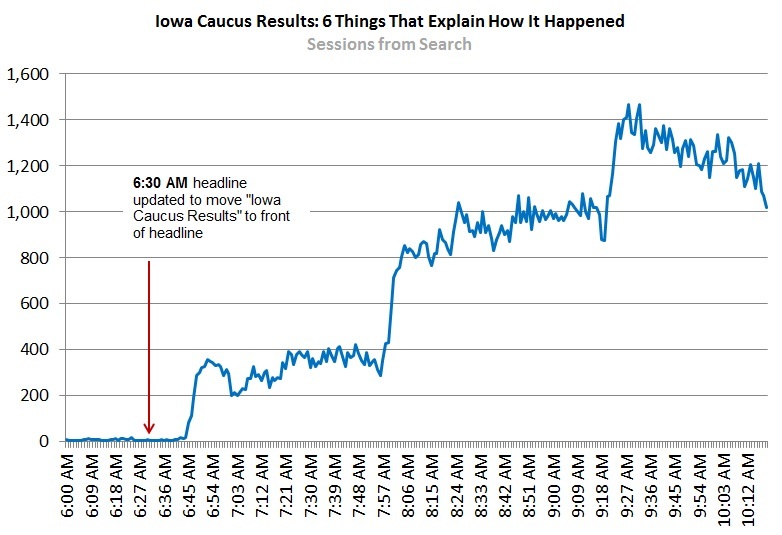 One such case was our recap on the Iowa caucus (graphed below). After an early morning headline change we saw traffic take off and it ended up being our second most viewed story of the entire day with 60 percent of its traffic coming from search. Our top story? Our Groundhog Day piece which also had its headline tweaked to match what people were searching for. Some of our top web content leading up to and following the Iowa caucus were stories that helped people make sense of the news. The aforementioned recap of results was our top political story (with over 560,000 views and over 74 percent of readers finishing the entire article). But our stories on how the caucuses work (260,000 views), fact checking Hillary Clinton’s coin toss victories (92,000 views), analysis on the generational divide of women voters (71,000 views), and how evangelicals are deciding between candidates (58,000 views) were all among our top political content. Over 46 percent of the people viewing our political content on NPR.org Monday and Tuesday were under the age of 35 (compared to January where 39 percent of our politics audience was under 35). About 57 percent of that audience was made up of men, compared to 59 percent throughout January. Among respondents to our post-caucus survey, 72 percent of our core audience followed NPR’s coverage in some way. Forty-four percent listened to their local station, 23 percent reported using NPR.org, and 10 percent were following along on Twitter. Keep in mind that our audience may have used one or more of these methods to follow us since over 40 percent of them reported dual-screening the caucus on more than one device. Our intern, Cheryl Au, analyzed emails we received from NPR’s Audience and Community Relations team. She found that about 18 percent of emails that we received following caucus night wished that we would have provided greater clarity on Hillary Clinton’s lead over Bernie Sanders. Among those, many mentioned that they wanted more analysis on delegate counting, the reported coin tosses, and more precise details on how much of a lead she had over Senator Sanders. Iowa Public Radio saw a 48 percent increase in web traffic during Monday and Tuesday, highlighting how people use local news to supplement what they get from national news sources. NPR’s election night app was a nice success, reaching over 150,000 users Monday night into Tuesday. Among users who started audio, 26 percent listened for at least 15 minutes and 16 percent listened to a half-hour or more. Collectively our users spent an estimated 59,000 hours on the Democrat results screen versus 17,000 hours on the Republican results, a reflection of just how close the race was between Bernie Sanders and Hillary Clinton. The app also led over 1,000 people to sign up for our politics newsletter! Dan Frohlich is a digital metrics analyst at NPR.